:The Brazos Theological Commentary on the Bible advances the assumption that the Nicene creedal tradition, in all its diversity, provides the proper basis for the interpretation of the Bible as Christian scripture. The series volumes, written by leading theologians, encourage Christians to extend the vital roots of the ancient Christian tradition to our day. In this addition to the acclaimed series, two respected scholars offer a theological exegesis of Esther and Daniel. As with other volumes in the series, this book is ideal for those called to ministry, serving as a rich resource for preachers, teachers, students, and study groups. About "Esther & Daniel (Brazos Theological Commentary On The Bible Series)"
Sumner is principal of Wycliffe College, Toronto, Ontario. 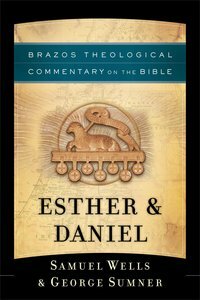 Customer Reviews For "Esther & Daniel (Brazos Theological Commentary On The Bible Series)"